The Göttingen Academy of Sciences (in German Akademie der Wissenschaften zu Göttingen) is the second oldest of the seven academies of sciences in Germany. It has the task of promoting research under its own auspices and in collaboration with academics in and outside Germany. It has its seat in the university town of Göttingen. The Königliche Gesellschaft der Wissenschaften ("Royal Society of Sciences") was founded in 1751 by King George II of Great Britain, who was also Prince-Elector of the Holy Roman Empire and Duke of Brunswick-Lüneburg (Hanover), the German state in which Göttingen was located. The first president was the Swiss natural historian and poet Albrecht von Haller. 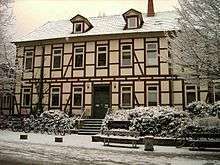 It was renamed the "Akademie der Wissenschaften zu Göttingen" in 1939. Among the learned societies in the Federal Republic of Germany, the Göttingen academy is the second-oldest after the Halle-based Leopoldina (1652). ↑ Note that the German Wissenschaft has a wider meaning than the English "Science", and includes Social sciences and Humanities. The complete series (48 volumes) of Abhandlungen der königlichen Gesellschaft der Wissenschaften zu Göttingen, 1843-92, Göttingen, in der dieterichschen Buchhandlung.